You might be a blogger if whenever you head outside with a camera in your hand, you have in the back of your mind that you need to find a good sky shot for your weekly Friday meme! As I was enjoying the beautiful blue skies down in New London this past Tuesday, I most definitely had in the front of my mind that it was a perfect chance to get a picture or two for Tisha's Looking at the Sky on Friday meme - especially when a puffy white cloud or two floated into the area! As you can see, there were a couple of light airy clouds floating over the Groton side of the Thames (pronounced like James and not like Tims as our British friends call their river of the same name over The Pond). I took these pictures from the New London city pier which is located directly behind the Amtrak station and gives a great view of Fort Griswold located on Groton Heights across the Thames. 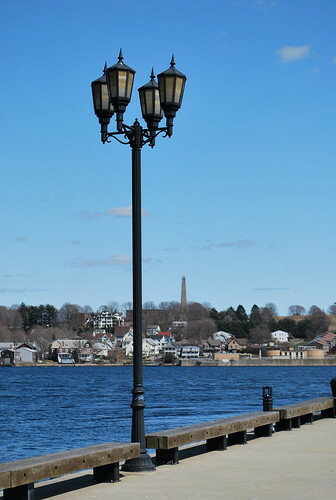 The City of New London has done a wonderful job fixing up the waterfront area which includes these lovely older style lampposts that line the pier and the walkway along the river. I bet at night they look really nice so I'm going to have to take a trip down there around sunset sometime and see what I can get for pictures. 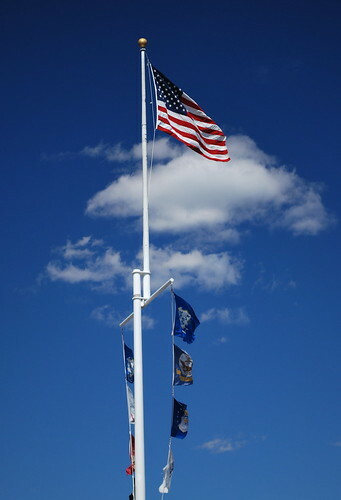 These flags are also located on the city pier and boy, were they ever blowing in the breeze on Tuesday! If you look closely, I bet you can hear them flapping in the wind! Whenever I see the American flag in a beautiful setting like this I always think of my father and the other men and women like him - for example Sarge Charlie - who served in the military and fought to keep our country free. I know that if it weren't for them, that flag very well might not be there and I am grateful to every single one of them. Maybe it's because I was raised an Air Force brat or maybe it's just that I'm a sentimental sap but I do love to see the Stars & Stripes unfurled and waving proudly over our country. Lastly, this sky shot shows some of the ferries that ply the Thames River going back and forth between Long Island and Fisher's Island. 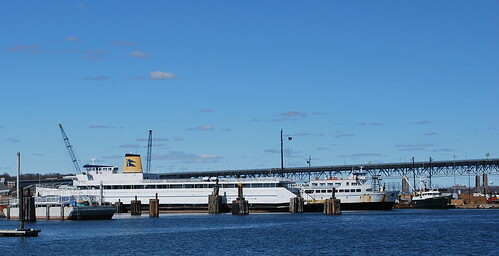 Provided I still go, the high-speed ferry that I will be taking out to Block Island in June will also be leaving from New London. The bridge that you can see in the background is the Gold Star Bridge (a bridge that my mother positively hates to drive over!). Directly on the other side of the Gold Star bridge is the United States Coast Guard Academy and - just a little further up the river - the New London U.S. Navy Submarine Base. Unfortunately, those blue skies on Tuesday are now just memories found in pictures as we're looking at rain here in Connecticut all day today as well as tomorrow. Sigh. Ah well, April showers are needed if we're going to get those May flowers, right? Wherever you may be, I hope your Friday skies are beautiful! 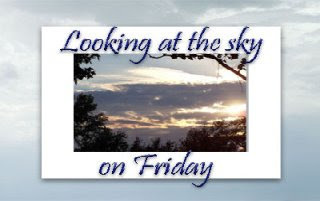 Don't forget to stop by Tisha's and visit some of the other Looking at the Sky on Friday links! Amen to our troops and veterans! Love the flag and lamp post shots! I'm with you, love all our military! I'm with your mother... hate driving over bridges! That flag photo is gorgeous! Have a great Friday, even if it's rainy. But you made me laugh out loud by your first sentence! I TOTALLY do that! I'll think "Crap, I don't have any sky shots, MUST get sky shots" or "I have NOTHING for Camera-Critters... c'mon critters, I need your photos"
Linda, you picked the best day to take pictures on the Thames. The shy is so blue and the reflections of the sky in the water are soooooo blue as well. The Gold Star bridge is ten lanes of mirth and merriment, wouldn't you agree?? Beautif shots. The sky & water looks so blue. The clouds are very subtle but cool. Beautiful, beautiful photos. It's funny how these memes can almost take control. OMG... those shots are so beautiful. I felt like I was there too. Charlie's a thieve. Great shots as always! Sounds like a neat place to live. I love San Francisco in California, and I think part of its charm is the Pier. How can the British call it Tims when it has an A? Ah well, language can be funny sometimes! You can't read some or you can't pronounce ones correctly! Very beautiful photos, I like your first photo. Whenever I see the American flag, (even though I'm not American) I'm suddenly overwhelmed and I feel like crying LOL. Same goes for our flag too, of course. lovely set of shots Linda! Wow, Linda these shots are simply amazing! I loved the one with the lamp post the most. The skies were a brilliant blue weren't they?! Last saturday coming back from our ride the sun was setting...and I'm trying to get a shot for Tisha's Meme. Your photos are truly lovely. nah. Just a proud American. You can never be a sap for loving our flag! That's a gorgeous shot, btw. GOD Linda!!! Your photos never stop amazing me! Keep up the awesome, awesome work!